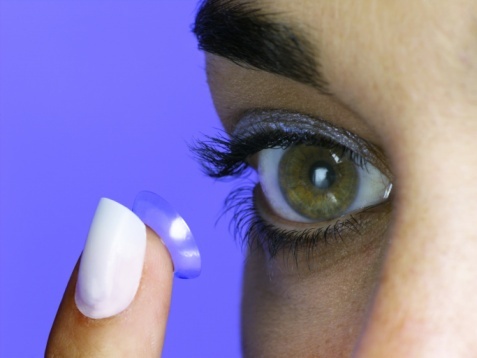 Why would anyone want to wear contact lenses, much less give them a second shot? The answer is simple: millions of people believe that contact lenses are liberating and offer outstanding vision and comfort without the need for glasses. But not all of the world’s happy contact lens wearers were satisfied with the first contact lens they tried. Some even stopped wearing lenses for a long time and were convinced, years later, to give it another go. Contact lens materials and designs are constantly changing, so there’s a very good chance that newer technology may better meet your needs. Improved treatments and diagnostic tools are also helping doctors offer unexpected freedom from glasses to those who thought they could never be properly fit in a contact lens. If any of this rings true for you, read on for more on how you may be able to join the ranks of satisfied contact lens wearers. Presbyopia: This unavoidable age-related condition usually starts to show up in your 40’s and makes it hard to see objects up close—especially if you’re wearing contact lenses designed only to help you see faraway objects. Poor vision: Few things in life are more frustrating than unstable vision, yet it’s a reality that many people deal with every day. If you wear a standard off-the-shelf contact lens (versus one that’s been custom-designed for your eye), occasional blur, glare and halos around images at night might be part of your everyday life and are a common cause for contact lens dropout. Comfort issues: Finding the right balance of good vision and acceptable comfort can be a challenge. Many people find that soft lenses are more comfortable and convenient than “hard,” gas permeable (GP) ones, but this lens choice often involves a tradeoff since GP lenses are known to deliver superior optics vs. soft lenses. Would a hybrid lens design offer better optics than the lens I’m currently wearing? If you have trouble driving at night or if your vision is intermittently blurry, it’s time to look for a new lens. The development of hybrid lenses marks one of the greatest advances in contact lens technology because these lenses provide the best of two worlds—the optical quality you’d expect from a gas permeable lens and the comfort you’d expect from a soft lens. The high-performance, advanced-technology Duette lens by SynergEyes is designed for people who don’t want to choose between clarity and comfort, and for individuals whose professions and lifestyles demand uncompromising vision. Can I try a lens for my astigmatism that won’t cause blur when it rotates? A clinical study of four leading toric lens brands reveals that 74% of rotated toric lenses are still significantly misoriented after 60 seconds.5 This is not only inconvenient—it can be unsafe, especially when you’re driving. Unlike a toric, the optics in the Duette lens by SynergEyes is very stable, and vision is unaffected by lens rotation. Do you perform dry eye diagnostics and can you recommend any new treatments? If you have dry eyes, it can impact your comfort in contact lenses. Dry eye is a very hot topic in eye care and it has received a lot of attention in recent years. Today, doctors have a much more in-depth understanding of dry eye than they did a few short years ago. One of the most valuable things that doctors now know is that the clinical signs and indicators of dry eye don’t always match the symptoms you’re having, which might be much worse. In the past, doctors frequently told patients to use any artificial tear if their eyes bothered them. But now, doctors are finding that inflammation is frequently an underlying factor—even when they don’t notice it during a routine exam. For this reason, new diagnostic tests have been developed that can objectively diagnose and measure dry eye so that your doctor can select a treatment that’s more likely to be effective. Is there a more comfortable alternative to my GP lenses? One alternative to a GP lens is a hybrid design. Hybrid lenses are both hard and soft. Made by SynergEyes, these advanced lenses combine a GP center (so that the optics are crisp and consistent) with a soft lens skirt (so that you also can enjoy the benefits of comfort and ease-of-wear). As an added bonus, the soft lens skirt helps to prevent dirt and debris from getting under the lens, which can be especially important for athletes. Do you offer multifocal contact lenses for presbyopia? SynergEyes offers a multifocal contact lens, called Duette Progressive, which works much like progressive glasses. The Duette Progressive has a range of powers from near to distance to enable you to see up close, far away and everywhere in between. But, unlike progressive glasses, these contact lenses do not require you to tilt your head to find the right spot for seeing at different distances. As you can see, there have been many new advances in contact lenses in recent years. If a spectacle-free life sounds appealing to you, but you’ve had trouble in the past, now is an excellent time to talk to your doctor about different options. Nichols JJ. 2010 annual report on dry eye diseases. CL Spectrum. 2010;15(8):22. 6. Key JE. Development of contact lenses and their worldwide use. Eye Contact Lens. 2007;33(6 Pt 2):343-5. National Eye Institute. Facts about dry eye. Available at: https://www.nei.nih.gov/health/dryeye/ dryeye. Accessed: January 2015. Begley CG, Caffrey B, Nichols KK, et al. Responses of contact lens wearers to a dry eye survey. Optom Vis Sci. 2000;77(1):40-6.